Algebra is the language through which we describe patterns. Think of it as a shorthand, of sorts. As opposed to having to do something over and over again, algebra gives you a simple way to express that repetitive process. It's also seen as a "gatekeeper" subject. 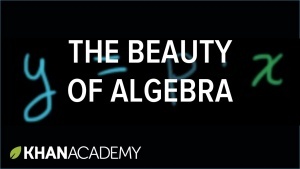 Once you achieve an understanding of algebra, the higher-level math subjects become accessible to you. Without it, it's impossible to move forward. It's used by people with lots of different jobs, like carpentry, engineering, and fashion design. In these tutorials, we'll cover a lot of ground. Some of the topics include linear equations, linear inequalities, linear functions, systems of equations, factoring expressions, quadratic expressions, exponents, functions, and ratios. CosmoLearning is promoting these materials solely for nonprofit educational purposes, and to recognize contributions made by Khan Academy (Khan) to online education. We do not host or upload any copyrighted materials, including videos hosted on video websites like YouTube*, unless with explicit permission from the author(s). All intellectual property rights are reserved to Khan and involved parties. CosmoLearning is not endorsed by Khan, and we are not affiliated with them, unless otherwise specified. Any questions, claims or concerns regarding this content should be directed to their creator(s).